If you are course coordinator for a course, you have to formulate the learning objectives for the course. They have to be approved by the Study Board. 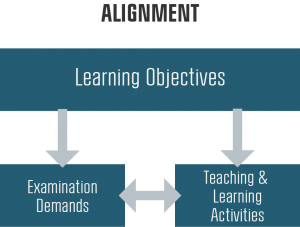 Learning objectives are, along with the teaching activities and the exam, what constitutes the alignment of a given course. The learning objectives set up the frames for the teaching activities and they have to reflect the progression of the study program. The individual learning objectives are formulated so they describe what the students have to perform at the exam and at the same time correspond with the competency profile for the specific study program. Courses at CBS normally have 3 – 5 Objectives. Make sure that your students understand the connection between learning objectives, teaching and exam. Bear in mind that bachelor students may have more difficulties understanding the formulated concepts. Here are a few verbs that clearly differ between different levels of learning. Articles by CBS' Nicki Brøchner Nielsen that presents a point of departure for on-going development of the learning objectives of a course.